Anyway, this is the first pattern I found using the scraps and what made me dig to find more as I thought that was something useful in daily life. The pattern comes from Dog Under my Desk and it’s probably one of my favorites from how high quality it looks when you’re done. Materials needed were about a 6″x7″ piece of fabric for both inner and outer fabrics along with the same amount for interfacing (midweight again). 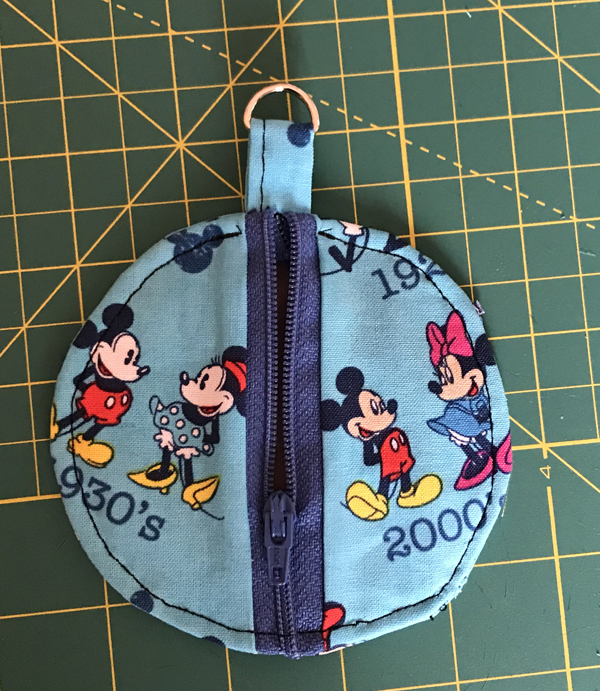 A keyring (or hook) and a 5″ or longer plastic zipper. You’ll have to print out the provided template, but it prints true to form so as long as you have a printer you’re good to go. Cut your fabric per the pattern requirements while your iron warms up. 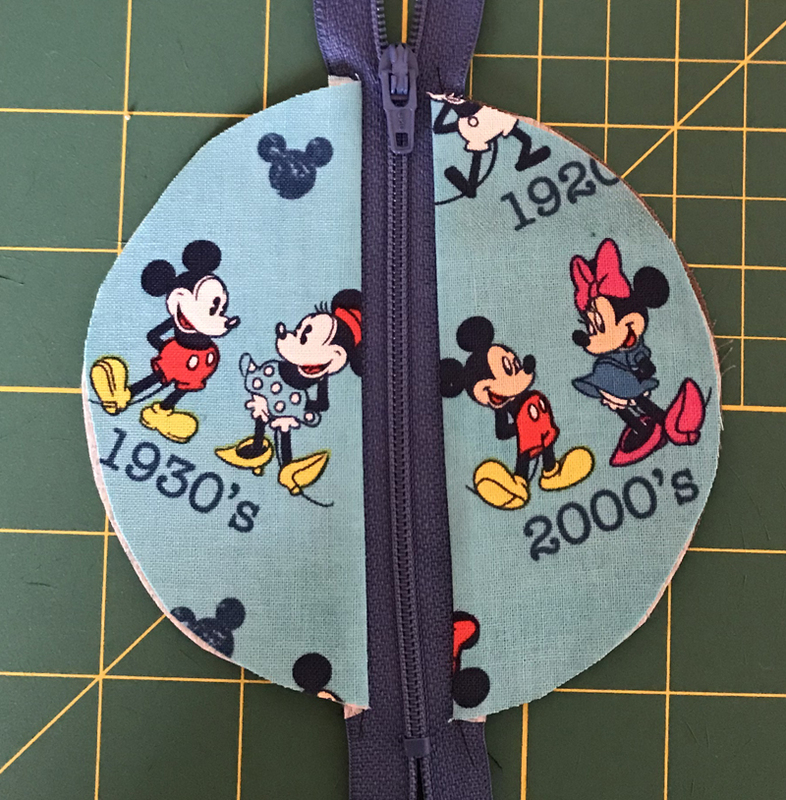 Then apply interfacing to the circle and 2 half circles for the fabric you want showing. Now, I’m not even going to try and write up how to explain adding the zipper cause I’ll screw it up, lol, but that where you’ll start by layering the half circles on one side (curved ends facing the zipper with right sides of the fabric facing each other), sewing, pressing, and then repeating on the other side. You’ll end up with something like this. 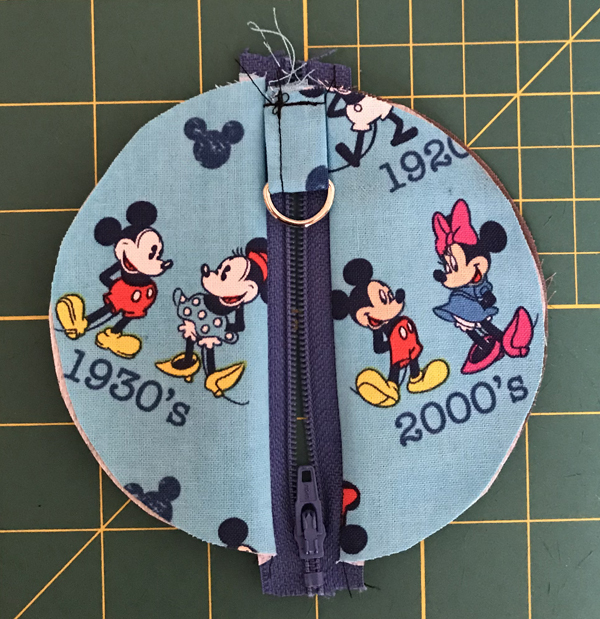 Next you’ll make the tab and sew it at the top of the circle edge where the zipper pulled from. I accidentally did this at the bottom on my first one. So learn from my mistakes, lol. The tab should be laying on the zipper track towards the inside of circle when you do it. 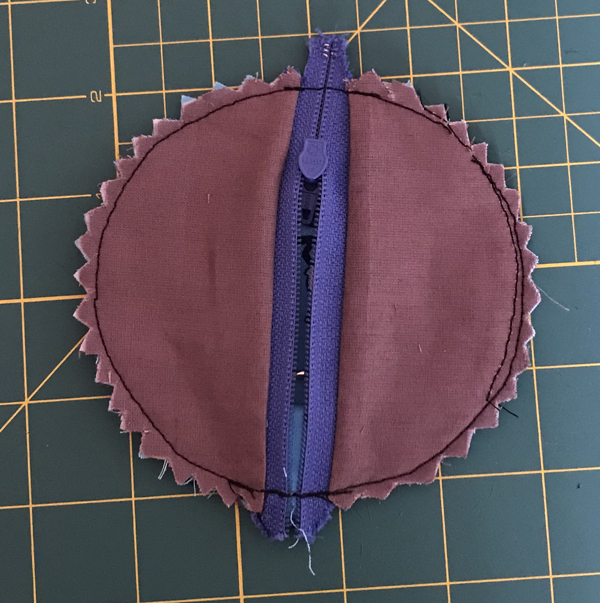 Now, making sure you zipper is in the middle of your circle, layer the circles with right sides out -not touching- and lay it on top of the zipper (yes you’re covering the zipper. This is why it needs to be half way down so you can reach inside). The the fabric you want on the outside should be touching when you do this. So for me, zelda fabric touching zelda fabric and green on the top. Start anywhere you like, but I did it at the tab on the top. I also recommend do a few back and forth stitches here to reinforce that tab. 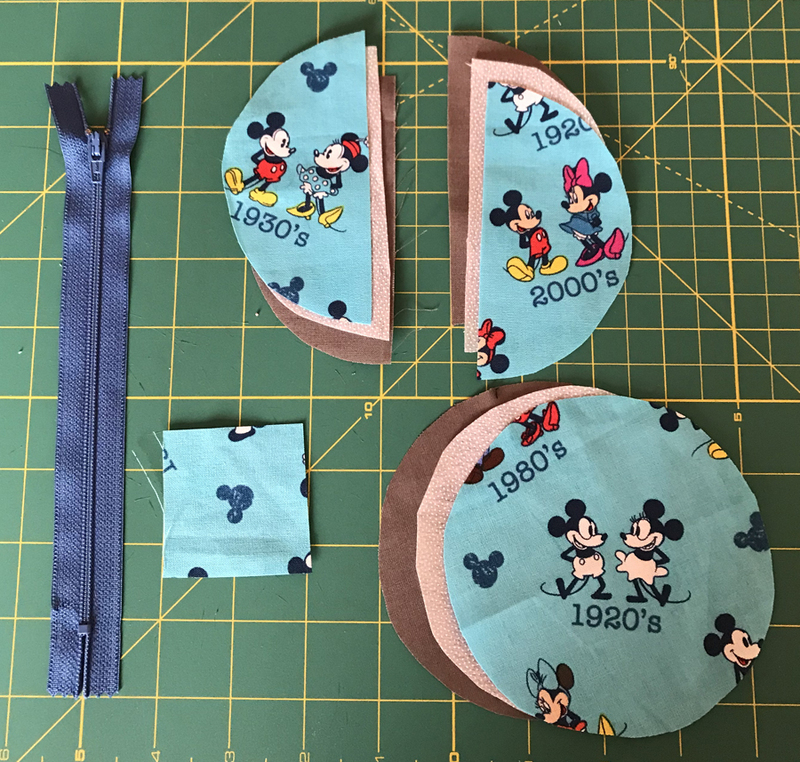 You’ll want a 3/8″ seam on this one, so give yourself extra room and if it starts to bunch/pucker then stop sewing, lift the foot and smooth things out before continuing. Once you’ve sewn the edge, you also want to pinking shears to trim the edge. I used scissors my first time to clip the circle and the shears work waaaay better. This is why you had to leave so much space for your seam. Once you’re done just turn it inside out and ta da! You’ve got a pouch! I really like how this looked and part of that admittedly is cause I did fussy cutting to get the image centered just how I wanted. It’s really just a nice little case and I may even make some as gifts for my family. 🙂 Overall I’d rate this a 5/5 bobbins. Great little pattern, but take your time and follow the step by step info at Dog Under my Desk and not my general ramblings.